Ukrainian Borscht is a delicious and healthy vegetable soup that is known and prepared throughout Russian/Slavic cultures. This version includes beets, cabbage, potatoes, carrots and can easily be made vegetarian/vegan. It seems like recently I am posting recipes in mini-series. There were all the Paraguay trip-inspired posts (which was actually a longer series), then there were bite-sized desserts (topped with candy), and now I am sharing the second ‘Russian‘ recipe in 2 weeks. 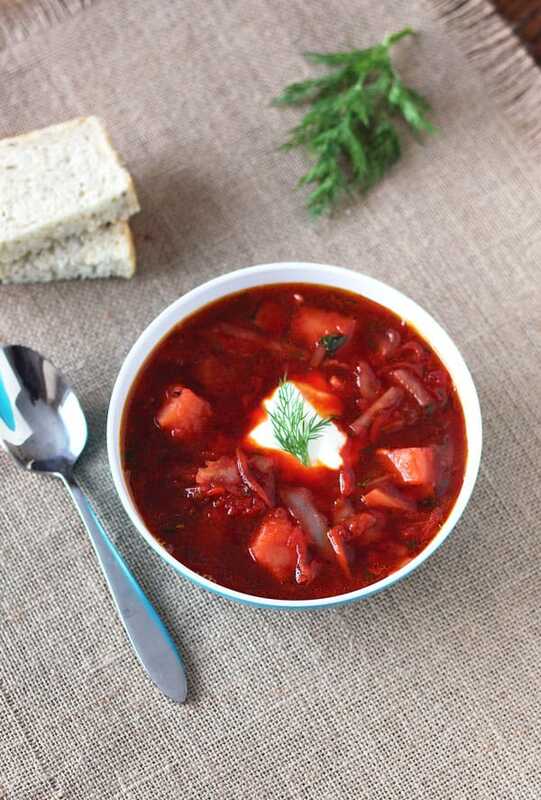 Now, technically and originally, Borscht is a Ukrainian dish, but just as with the Uzbek Plov, it is a meal that – in some form or other – is known and prepared throughout Russian/Slavic cultures. 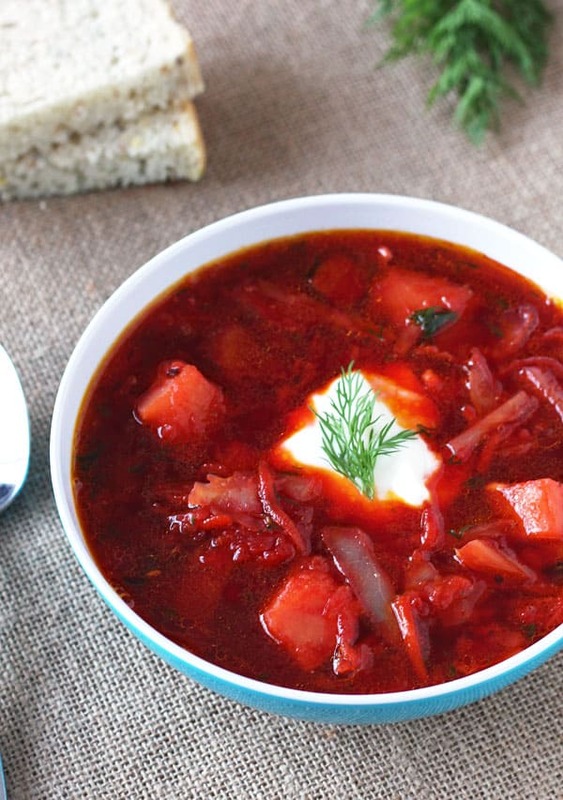 There really are so many variations of Borscht. Some use beets while others don’t. You can make it meatless as veggie soup, or you can add any kind of chicken, beef or pork. Some families add beans, others add mushrooms. It’s all up to taste. 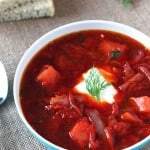 I think the 3 common ingredients along the whole ‘Borscht spectrum’ are cabbage, potatoes and tomatoes (or sauce/paste). And now that I wrote it out, I am sure someone might read this and tell me they know Borscht without even these three. Well, this recipe is Borscht how I know it from my mom (hmm…together with the Plov and Cauliflower casserole, ‘mom-inspired‘ could be yet another series). It is quite a healthy soup full of good-for-you vegetables like beets, cabbage, carrots, and onion. And as all the different variations show, Borscht is very open to adaptations. For a meatless (vegetarian/vegan) Borscht, I’d recommend using vegetable broth instead of water for added flavor. Just start with point 2 in the recipe instructions. Whatever version of Borscht you cook, I will always recommend NOT to omit the dill. It just adds a little something special that you don’t want to miss. Dill is a wonderful addition. I grew up eating Borscht served with a dollop of sour cream, while my husband’s family adds a splash of whipping cream. As stated before, to each their own! Also, this recipe makes are large pot of soup. Perfect for leftovers. I’d actually dare say that Borscht tastes even better on day 2. Leftovers can also be frozen. How good! Wash and dry the meat and cut into 1" pieces. Heat a large 6 quart soup pot with 4 tablespoons olive oil. Once the oil is hot, add the meat and quickly brown from all sides (about 5 minutes). Fill the pot 2/3 full (4 quarts) of water and add bay leaves and salt. Bring to a boil on high heat, then turn to low and cook for about 1 hour for meat to become soft and tender. Skim off any grey foam. Prepare your vegetables in the meantime. Cube the potatoes, shred the cabbage and set aside. In a large pan heat 2 tablespoon of oil and saute chopped onion until softened. Add chopped bell pepper and soften as well. Wash and peel carrots and beets. Grate by hand or shred with shredding attachments of your food processor (takes only a fraction of the time). Add shredded carrots and beets to pan and saute until softened (about 10 minutes). Lastly add diced tomatoes and saute another 5 minutes. Once the meat is tender, add potato cubes to the soup and boil until almost done (10 minutes). Add shredded cabbage and cook for 5 minutes. Lastly, add sauteed veggies, black pepper and herbs (more salt, if needed). Bring to a boil, then turn off heat, cover and let stand for at least 10 minutes. Remove bay leaves and serve with sour cream (or a splash of heavy cream) and a fresh dill sprig. My kind of soup, Regina. I always thought beet is one of must-have ingredients in this Russian classic. Yours looks surely delicious! Thank you very much Dina. 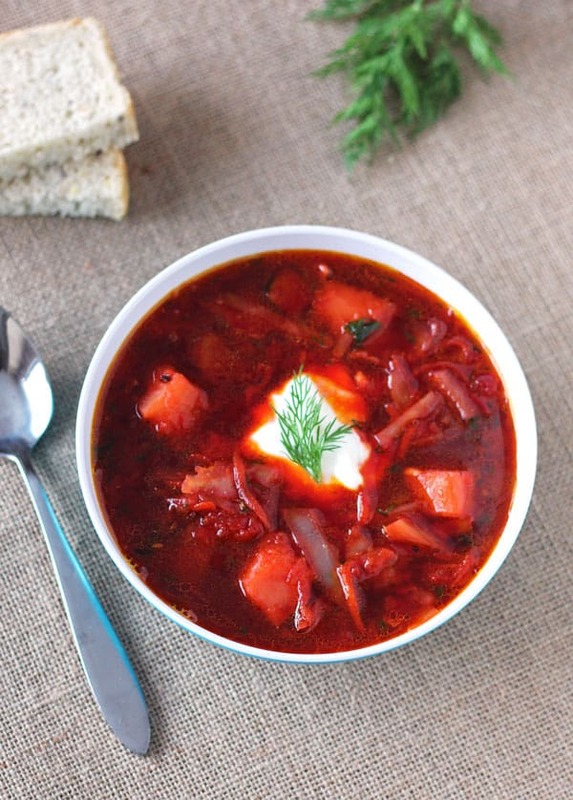 Borscht absolutely is comfort food in my books!